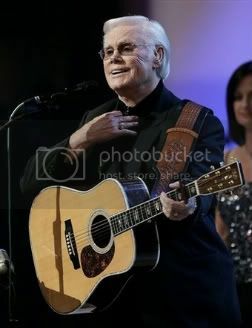 The silver-toned devil, the greatest living country music singer George Jones received the Kennedy Center Lifetime Achievement Medal this week for giving country music 50+ years of his life, and counting. George hasn’t missed a step either, despite the drug abuse and brushes with the law. He’s completely sober now, and witty as ever. There’s a great article by the Washington Post about George Jones HERE , and you can also check out a picture gallery of his career HERE. The REAL CMA results are in and whether your nominees won or not, I think we can all agree this was a great way to give our country heroes some credit, and hopefully turn some people on to some great REAL country artists. I thought most notably in the list was that Dale Watson won “Best Kept Secret,” and though I have to say I was surprised at this at first, it makes complete sense to me. Oh, and one last thing. It’s someone’s birthday. The hint is 1 + 2 = ?? ?